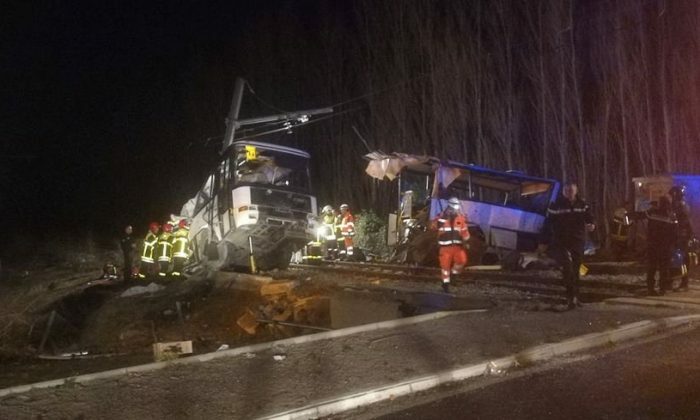 PARIS—The death toll from a collision which saw a train rip a school bus in half rose to six on Friday after doctors in southern France lost the battle overnight to save two of those left seriously injured, a source close to the investigation said. Forensics experts were combing through debris at the road crossing near the town of Perpignan, close to the border with Spain, as they sought to reconstruct events in the seconds before Thursday afternoon’s accident. Hospitals appealed for blood to help them treat six others who remain in a critical condition after an incident described as “horrific” by Prime Minister Edouard Philippe, who flew to the scene last night. Government spokesman Benjamin Griveaux said the cause of the crash was still unclear. It occurred at a crossing which was not considered dangerous. The local prefect, Philippe Vignes, said the four children who died on Thursday were aged 12 and 13.